HOTROD same car also won the best of show at the Concours d' Elegance in St. Joseph, Michigan. "To be in that category alongside hun- dreds of phenomenal cars and to be rec- ognized in that way was really quite an honor," says Morey. Having high-profile success at some of the most exclusive car shows in the coun- try also happens to be a solid marketing strategy. 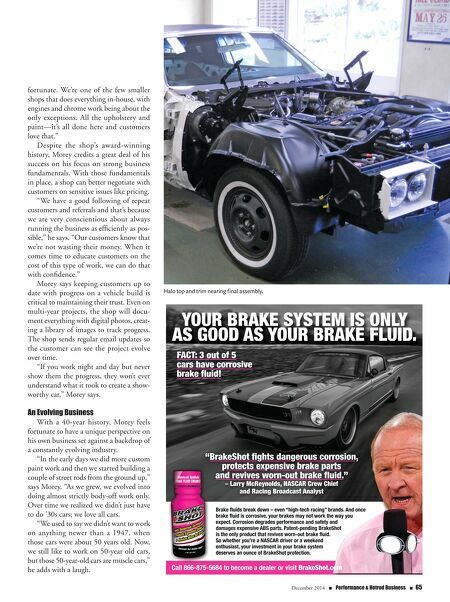 "With those shows, the more frequently you attend and have a vehicle do well, the more likely you are to get projects," he says. "You try to diversify so you always come with something different. This year, we'll do that same circuit, but with differ- ent cars." That approach—along with a com- munity of return customers built over decades—has kept RU2 Inc. busy even through a number of tough times over the years. "We've always been busy, even through the economic issues," he says. 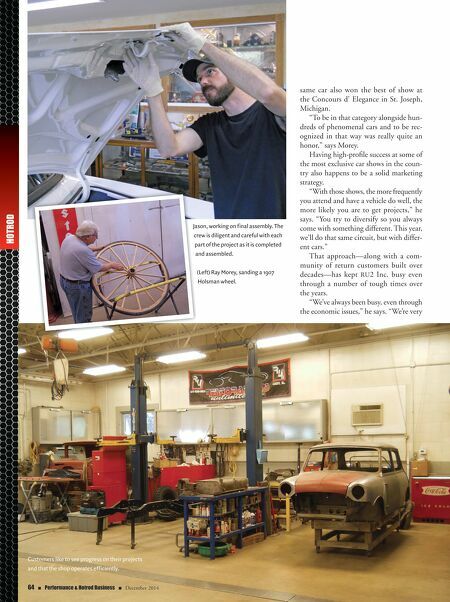 "We're very 64 n Performance & Hotrod Business n December 2014 Customers like to see progress on their projects and that the shop operates efficiently. Jason, working on final assembly. The crew is diligent and careful with each part of the project as it is completed and assembled. (Left) Ray Morey, sanding a 1907 Holsman wheel.